Russell Dawson Young, 95, of New Market, Maryland, passed from this life on Tuesday, November 6, 2018 at Frederick Memorial Hospital. He is the loving husband of 64 years to Carol Vaughn Young. Born on August 17, 1923, in Huntington, New York, he was the son of the late C. Halsey and Edna (Dawson) Young. In World War II, Russell served in the Pacific Theater as a Radio Officer in the Army. He left the Army after three years of active service as a First Lieutenant. Russell obtained his B.S. degree in physics from the Rensselaer Polytechnic Institute in 1953 and his Ph.D. degree in physics from Pennsylvania State University in 1959. 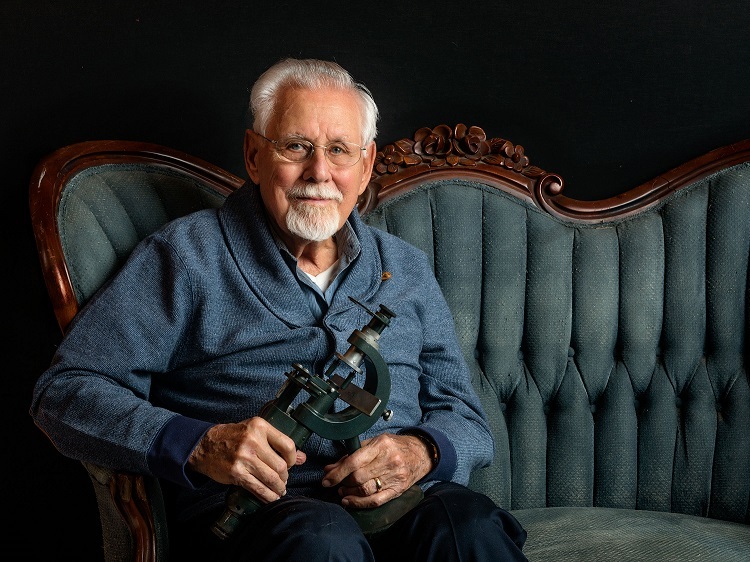 He remained at Penn State in the laboratory of Professor Erwin Mueller for his postdoctoral research, which was marked by several outstanding achievements, including the widely recognized milestone of capturing the first image of an atom. Further achievements include the development of a high resolution field emission energy analyzer and the first measurement of the total energy distribution of field emitted electrons, as well as contributions to the development of the low temperature field ion microscope. He came to the National Bureau of Standards (NBS) in 1961. His development of the Topografiner was an outgrowth of his continued study of surfaces at NBS. After the termination of this project in 1971, he remained at NBS, which later became the National Institute of Standards and Technology (NIST), in both a technical and an administrative role until his retirement in 1981. Since then he has actively pursued his interests as an inventor and a private consultant to industry and government. Dr. Young's achievements have been recognized in several awards. In 1974, he was the first recipient of the Edward U. Condon Award, conferred by NBS in recognition of outstanding scientific writing. He received the U.S. Department of Commerce Silver Medal in 1979, a Presidential Citation in 1986, and the Scientific Achievement Award of the Washington Academy of Sciences in 1987. In 1992, the American Vacuum Society recognized his invention of the Topografiner by presenting him with the Gaede-Langmuir Award. Alongside his career, Russell was a devoted son, brother, husband, father, grandfather, and great-grandfather. In his free time, he enjoyed camping, biking, sailing, and traveling. He spent the winter months in one of his favorite locations, sunny Florida. In addition to his wife, he is survived by four daughters: Beamie Young , Gale Richter , Janet Bass, and Shari Young; eight grandchildren: Jack McCulloch, Josh McCulloch, Matthew Richter, Megan MacCauley, Jessi Full, Melissa Richter, Halsey Sawyer, and Lily Bass; and ten great-grandchildren: Emma McCulloch, Jackson McCulloch, Molly McCulloch, Margo Full, Charley McCulloch, Brady Richter, Stella Full, Tyler Richter, Henry MacCauley, and Victoria MacCauley. He was preceded in death by his brothers, Donald and Laurence. Friends and family are invited to the celebration of Russell's life which will take place at 2 p.m. on Sunday, November 11, 2018, at Stauffer Funeral Home, 8 East Ridgeville in Mt. Airy, MD with Arthur Hayes presiding. Immediately following the memorial service, friends are welcomed to join the family for refreshments and fellowship at the funeral home. In lieu of flowers, memorial donations may be made to the Chesapeake Bay Foundation.